In the highly competitive world of today, education is everything. It effects the types of jobs from which a person can reasonably apply. It effects how much money one takes home to their family. It even effects the way in which the community at large perceives someone. Indeed, receiving a “proper” education from respected teachers and professors is stressed upon the everyday lives of everyone. But was this always the case? A passing glance at The Hay Jay School, a vital piece of Williams County history, shows that such pressures are, in fact, a modern invention. Built in 1901, the one-room school, located on the outskirts of County Road 8, is believed to have taken its name from the now non-existent town of Hay Jay. Believed to have been disbanded between the years of 1875 and 1880, the village itself was centered around the intersection of County Roads 8 and R, though no sign that it was ever there is still present. When the school finally closed its doors in 1957, residents of the would be town bought as much of its contents as possible at auction. Then, 40 years ago, when the Williams County Historical Society purchased the building, the former community donated everything back and preserved the only standing memory that Hay Jay ever was. Since coming into the possession of the Historical Society, the building has had a few minor additions, such as replacement windows, a new bell tower, and an extra step in front of the entrance in order to make it more accessible to the elderly. Still, the structure remains remarkably intact, maintaining its original foundation and siding. The original outhouses, necessitated by a lack of running water, are also still standing. According to Spencer Malone, who’s given tours of Hay Jay since 2000, the school was all about cooperation and teamwork. “The school was dynamic.” Malone shared. Before the school bell was even wrung, a collaboration between students and teacher was needed to start the day. The male students would come in early, and shovel coal into the burner. This dynamic continued throughout class. Holding students from grades one to eight in the same room, a teacher would have a difficult time making sure everyone was learning their lessons. Therefore, being paired together at each desk, the older students would help teach their younger counterparts whilst the teacher was spread thin. It’s an interesting idea, to be sure. Students teaching students. Such a concept is nearly unfathomable today. After all, students aren’t academics or scholars. What would they know about teaching? Perhaps they were able to relate with each other in ways an adult could not, having recently been through similar lessons. Maybe the younger students were more apt to take direction from someone other than an authority figure. It’s quite possible that working together, as opposed to doing work for someone, allowed for everyone to keep an open mind and focus on learning instead of impressing. 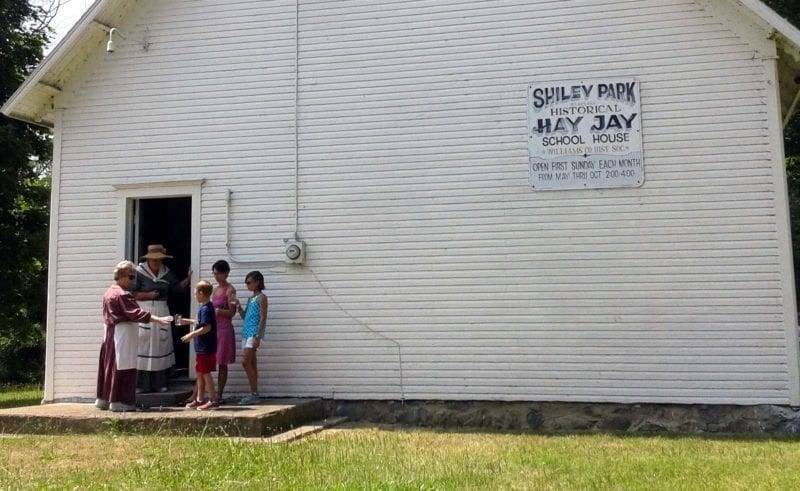 As The Hay Jay School continues to stand, it serves as a reminder to the county that education is more than just letter grades and prestige. Actually learning and cooperating with others are, at the very least, equal measures of what an education entails. A quick study of Hay Jay’s history will teach anyone that. Now it’s only a matter of who’s willing to learn. Be the first to comment on "Hay Jay: A Lifetime Of Learning Under One Roof"